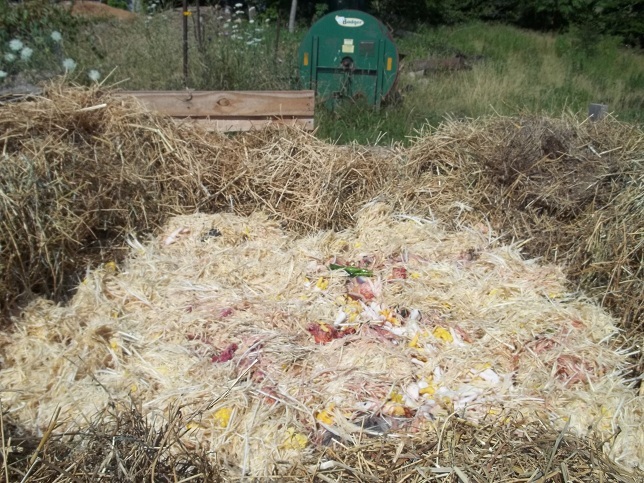 This entry was posted in Composting and tagged Building a compost pile, Composting, Composting Chicken Offal, Humanure. Bookmark the permalink. Mom has no sense of smell. My smeller is fine. We add to it at least weekly until April 1. It grows, it shrinks, it changes over time. We screen it as we empty the pile because pig bones and rabbit skulls usually need a second round of composting. Right now it’s hot, hot, hot. Once we stop adding to it the worms will move in and chew everything up. There’s no way I’m going to stir that volume of compost. I though all you islanders composted since it’s so expensive to haul trash across the ferry. We should all compost, but we do in fact have 2 or 3 landfills on Vancouver Island. The smaller Gulf Islands do have garbage issues – they are masters of recycling and composting – especially Hornby Island. The landfill for Victoria is almost full, and there’s a lot of controversy about what to do next…surprise surprise, they’re piloting a composting programme. I thought Nanaimo limited them to 2 cans/week when I was there in 1999. I think we put out 2 cans/month now…easier now that we don’t have kids in diapers. The 2 cans/week is typical service, but I think you can pay for more if you want. For some municipalities garbage pick up is part of the taxes, for others you have to hire a company if you want the service. I think that’s fascinating. I feel a blog post coming on. If it’s hot in winter can you grow stuff on top the pile? I remember the gardener barrowing up top soil and then putting dutch lights/cold frames o top of the manure piles when I was a kid…. we’re talking about manure heaps 50feet long and ten feet high(and more)….. My father was a cowman….. In summer the grass snakes laid their eggs in the heap…. after two winters the manure was spread on the meadows and other fileds….. in the 60s the demise (almost complete) of mixed farming mean the soil structure died with in three years….. 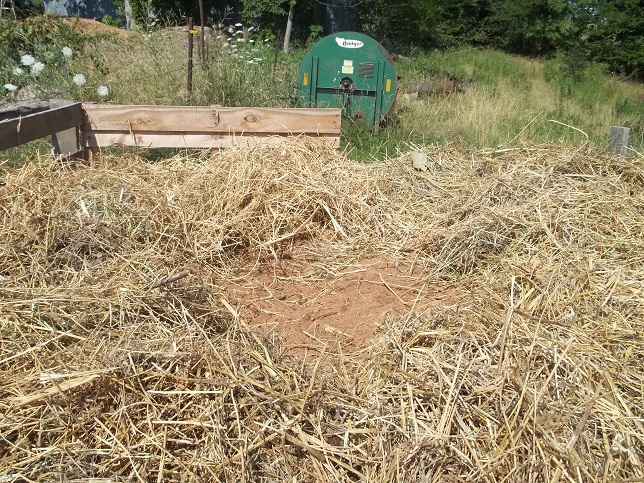 I tried to build a hot bed for pumpkins and squashes this year but …not enough manure……. I have seen tomatoes started above manure compost piles like you describe in unheated greenhouses. I have personally dug out a foot beneath a cold frame to pile manure in to get my brassicas off to a good start. You included a lot of good detail in your comment. I agree about the demise of mixed farming and the loss of soil structure. You can’t build soil without manure. We have placed all our cows in feedlots now where manure disposal is a problem instead of many thousands of farmers keeping cows on pasture where they can spread their own manure. I think it will have to turn around. 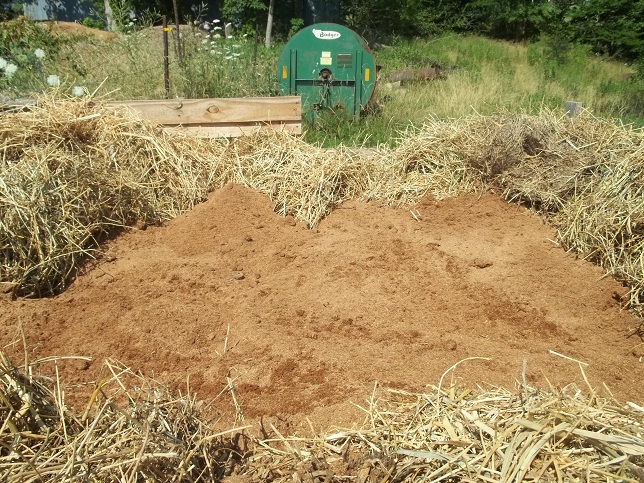 We have tons of composting material with just 3.5 acres. Can’t begin to imagine how much lovely stuff you must accumulate to add to a compost pile with your acreage and animals. Always amazes me how much green is pulled and pitched from a garden. Flower or veggie, either one. Russell piles it and just digs out from under when he wants some compost. Never turns it or even manages it. If I had the physical strength, I would make the compost piles work harder. We have four places we dump yard and kitchen composting material right now. Not to mention the burn pile for bigger limbs, etc. We pre-compost most of our green material through our livestock. Chickens and ducks get the garden weeds here at the house, the horse gets the weeds at the other garden. 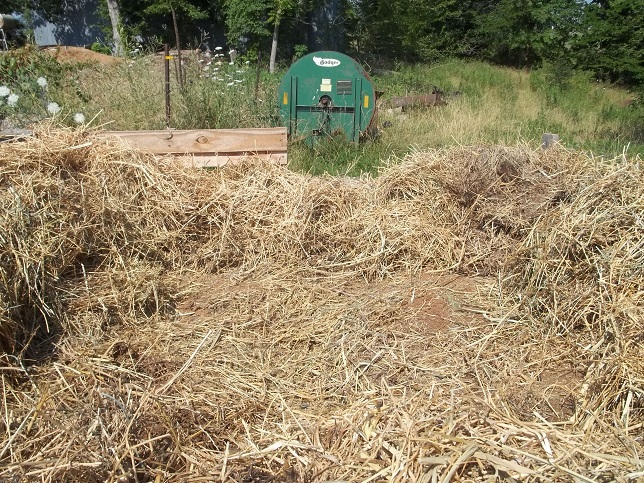 Our compost piles are mostly manure, bedding animal waste and the odd kitchen bits we won’t feed to livestock. 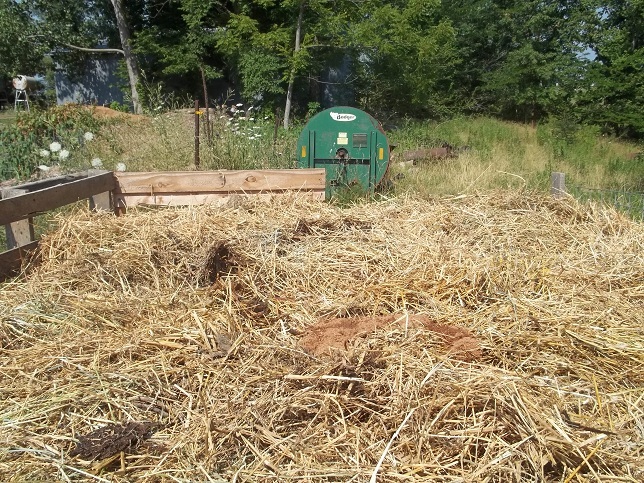 My Dad used to make a hot bed to raise his hot weather plant (tomatoes, peppers, eggplants, cukes) by making a square with old bales and filling it with manure, and putting his cold frame on top. They did it that way for all sorts of things when he was a boy in England (same cool climate I guess). Thanks for the link! Great information for when we start our homestead, complete with broilers. I long for the day!